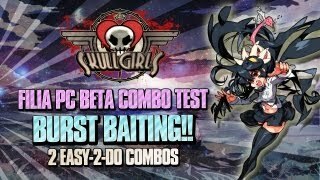 Taking to the PC beta of Skullgirls, Finally Anime went to the training mode to showcase some burst baiting combos with Filia. Watch the "2 easy-2-do combos" inside. Time to show some love for Skullgirls. The fan favorite fighter has been making waves on the PC front with the game's beta version. Finally Anime is taking full advantage of the early access with two burst baiting combos for Filia.